The book is meant for students preparing for the Bihar PSC Examination and the other state Examinations. The book covers all the topics pertaining to the state in great detail as 30 to 40 percent questions in both the Prelim and the Main are based on Bihar State. The book includes Bihar’s History(ancient, medieval and modern), Economy, Information and Communication, Agriculture, Geography, Climate and Demography, water resources, Art and Culture, Education, Governance and Administration, Election and Politics and Important people of Bihar. The book is an all encompassing material on the state of Bihar. The book touches upon all the facets of greatness that Bihar represented in the past including those aspects that still remains undeciphered. An earnest study of the book will surely provide an edge to the preparation and help the aspirant realise their goal of becoming a civil servant. 9. Must read for all State PSC aspirants and Other State Examinations. 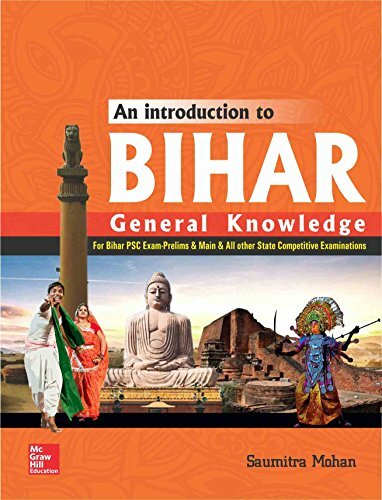 Buy the book An Introduction to Bihar General Knowledge: For BPSC Exams and Other State Level Examinations from Ideakart.com.